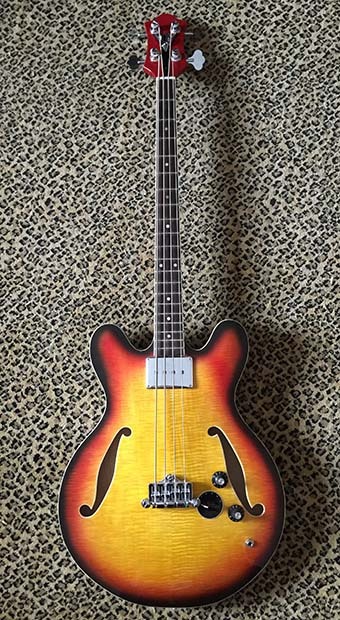 The Delta King Bass concept is to provide fuller, more balanced tonality than available in a standard semi-hollow bass, with extra emphasis on brightness and attack. The core and neck laminate design is key to both the guitar’s brilliance, warmth, and the rigidity of the slim taper neck. For added acoustic quality, the XL model increases the chamber size for enhanced bottom end response. The Delta King Bass is a fully handmade guitar for the ages, with unmatched tone and playability. All V16 guitars come with a lifetime workmanship guarantee. Body Size: Choice of standard 16” or extra-large (XL) 17” semi-hollow (add $500). Shell Wood: Choice of clear maple or curly maple (add $150) ply top, back, & sides. Core Wood: Standard 3 ¾” wide 5-ply core of quarter-sawn rock or soft maple, purple heart, and Honduras mahogany or traditional core of 4”wide rift-cut soft maple sandwiched between serrated layers of Honduras mahogany. Neck Wood: Choice of standard 5-ply quarter-sawn rock or soft maple, purple heart, and Honduras mahogany or traditional 1-piece quarter-sawn Honduras mahogany (add $275). Carve: Slim taper ‘60’s C-carve, .82” at the first fret, and .98” at the 12th fret. Other carves available upon request. Pickups: 1 or 2 pickup models or any configuration made to order. Call for information. Pickup Rings: As needed, made to order. Call for information. Controls: Varies by application. Call for information. Hardware: 3 point adjustable bridge, Hipshot tuners. Strap pegs of choice. (gold hardware add $100). 5-Ply B/W/B/W/B pickguard available (add $75). Poly finish: Standard and available in a range of colors at little to no extra cost, except natural (add $200).